Contact: Feel free to contact Tristan at (801) 609-1973 Please note that it is best to leave a message if I do not answer. I am with hospice patients throughout the day and do not take the phone in with me. I will happily return your phone call after my sessions are finished. THANK YOU! 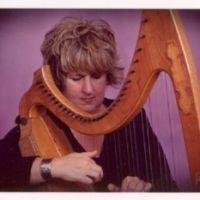 Additional Info: Tristan Adair is a wedding and event harpist, and a full-time working clinical musician (music thanatologist). She was pinned and graduated from the 2 year, full time, residential program, The School of Music Thanatology at St. Patricks Hospital in Montana. She has worked the last 23 years for hospices in Oregon and Utah, and has played more than 8,000+ sessions for hospice patients. Tristan uses harp and voice prescriptively, live, at the bedside, easing the passing and pain of the seriously ill and dying. She is available privately to assist the patient and their family through this difficult time and also to perform at funerals. Tristan started piano as a 4year old, and continues today to play solos and accompany others. She played violin, viola and landed on the contra bass where, after high school, she received full scholarships to two universities and then played professionally for years. Then, Tristan found the harp!! She now plays harp full time for hospices and works weekends and evenings doing weddings and private events. Tristan provides a free in person consulting session for her brides, and telephone assistance as often as needed. Please call her for weddings, corporate events, and of course, bedside music for the sick and critically ill.